A community garden can be for beautification or to provide food for a shelter or soup kitchen. 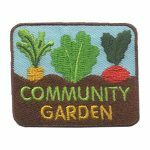 Whatever the reason your girls participate in a community garden, they will appreciate this patch from MakingFriends®.com. Learning about the importance of reducing, reusing and recycling items that can be reused. 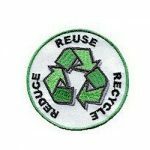 Commemorate the learning experience with the Reduce, Reuse & Recycle patch. Help save the earth and plant a tree. 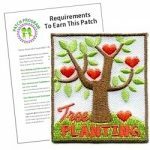 Whether your troop plants one for Earth Day, Arbor Day or any day this patch is the perfect reward.